Extracorporeal Shock Wave Therapy (ESWT) involves the conversion of a sound wave into a shock wave that is applied repeatedly to a specific area of the body. The technique is similar to lithotripsy, which is used to treat kidney stones. In recent years the technique has become popular in the treatment of a number of recalcitrant musculoskeletal conditions including tennis elbow, achilles tendinopathy, plantar fasciitis, and tendinitis of the shoulder. ESWT can be an effective treatment for the following conditions. An initial ultrasound will also be performed to demonstrate the pathology prior to treatment commencing. In most instances three (3) treatments spaced a week apart will be required to successfully treat the majority of patients. Some patients may require additional treatment if there is not sufficient energy given in three (3) visits. The initial appointment will take one hour but all subsequent appointments will only take 30 minutes. The treatment is very simple. The affected area of the body is positioned against the cushioned head of the ESWT machine. The converted shock waves or energy pulses are then applied to the affected area through the head of the machine. The number and strength of the pulses given depends on the patient and the area being treated, but a certain amount of energy needs to be delivered in order for the treatment to be effective. Following treatment it is quite common for patients to experience an exacerbation of symptoms. Please continue to avoid anti-inflammatory medication during the treatment interval. Paracetamol may be taken for pain relief. Some localised bruising may occur. Do I need a referral for ESWT? 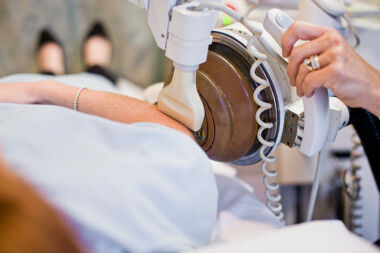 A Doctor’s referral is required for your initial diagnostic ultrasound scan. It should state +/- ESWT. 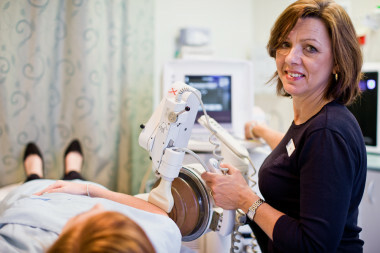 The ultrasound scan will determine if this type of therapy is appropriate for your problem. This does not form part of the ESWT and is billed separately. However, the majority of the cost is covered by Medicare. If you then decide to proceed with the ESWT treatment a further referral is not required. Is there a rebate for ESWT? The majority of the fee for the initial diagnostic ultrasound scan is covered by Medicare. However, ESWT is currently not covered under Medicare or by the Private Health Funds. Workers’ Compensation cases are dealt with on an individual basis.